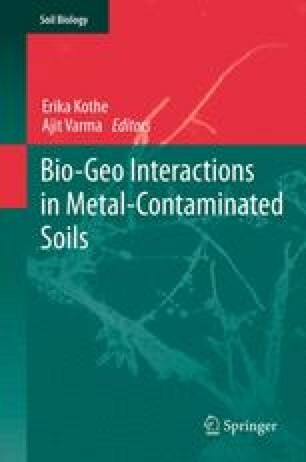 The chapter summarizes the research on the role of mycorrhiza in phytostabilization of heavy-metal-rich tailings from the ZG Trzebionka (southern Poland) industrial sites. The deposited substratum is difficult to phytoremediate. For example, plants conventionally introduced in such places disappear relatively soon, while those appearing during natural succession replace them. Properly developed mycorrhizal symbiosis enhances the survival of plants in such metal-rich areas by improving both nutrient acquisition and water relations. Moreover, mycorrhizal fungi were also found to play an important role in heavy metal detoxification and the establishment of vegetation. Certain fungal strains isolated from old zinc wastes also decrease heavy metal uptake by plants which grow on metal-rich substrates, thus limiting the risk of increasing the levels of these elements into the food chain. Mycorrhizal fungi isolated from the area were shown to be more effective in plant growth enhancement than those from nonpolluted area. Therefore, the effectiveness of the bioremediation techniques depends on the appropriate selection of both the plant and the fungal partners. This chapter was written within the framework of the Project UMBRELLA (EU FP7 no 226870). Vascular plant species recorded on ZG Trzebionka zinc wastes. Phytosiociological units (according to Szafer 1966), followed by origin on wastes, are given in parentheses: Sm/Av – Stellarietea mediae/Arrtemisietea vulgaris; QF – Querco-Fagetea; MA – Molinio-Arrhenatheretea; FB – Festuco-Brometea; KgCc – Koelerio glauce-Corynephoretea canescentis; Vc – Violetea calaminariae; C – spontaneous colonization; S – sown within restoration practices. Amaranthaceae: Amaranthus retroflexus (Sm/Av; C); Apiaceae: Aegopodium podagraria (QF; C), Daucus carota (FB; C), Heracleum sphondylium (MA; C), Pastinaca sativa (MA; C), Peucedanum oreoselinum (FB; C), Pimpinella saxifraga (MA; C); Artemisiaceae: Artemisia campestris (FB; C), A. vulgaris (Sm/Av; C); Asteraceae: Anthemis arvensis (Sm/Av; C), Aster novi-belgii (Sm/Av; C), Bidens frondosa (Sm/Av; C), Cardus crispus (Sm/Av; C), Centaurea cyanus (Sm/Av; C), C. jacea (MA; C), Chamomilla recutita (Sm/Av; C), Cirsium arvense (Sm/Av; C), C. vulgare (Sm/Av; C), Conyza canadensis (Sm/Av; C), Crepis biennis (MA; C), Erigeron acris (KgCc; C), E. annuus (Sm/Av; C), Eupatorium cannabinum (MA; C), Gnaphalium uliginosum (Sm/Av; C), Helianthus tuberosus (Sm/Av; C), Hieracium bauhinii (FB; C), Hieracium pilosella (KgCc; C), H. piloselloides (KgCc; C), Hypocheris radicata (Sm/Av; C), Lactuca serriola (Sm/Av; C), Leontodon autumnalis (MA; C), L. hispidus (MA; C), Leucanthemum vulgare (MA; C), Matricaria maritima subsp. Inodora (Sm/Av; C), Picris hieracioides (FB; C), Rudbeckia bicolor (Sm/Av; C), R. laciniata (Sm/Av; C), Senecio jacobaea (Sm/Av; C), S. vernalis (Sm/Av; C), Solidago canadensis (Sm/Av; C), S. gigantea (Sm/Av; C), Sonchus arvensis (Sm/Av; C), S. asper (Sm/Av; C), Tanacetum vulgare (Sm/Av; C), Taraxacum officinale (MA; C), Tragopogon pratensis (MA; C), Tussilago farfara (Sm/Av; C); Boraginaceae: Echium vulgare (FB; C), Myosotis arvensis (Sm/Av; C), Myosoton aquaticum (QF; C), Symphytum officinale (MA; C), Veronica officinalis (QF; C); Brassicaceae: Armoracia rusticana (Sm/Av; C), Barbarea vulgaris (Sm/Av; C), Berteroa incana (FB; C), Cardaminopsis arenosa (KgCc; C), Lepidium campestre (Sm/Av; C), Rorippa sylvestris (Sm/Av; C), Sinapis arvensis (Sm/Av; C); Campanulaceae: Campanulla trachelium (QF; C); Caryophyllaceae: Arenaria serpyllifolia (KgCc; C), Cerastium holosteoides (Sm/Av; C), Dianthus carthusianorum (FB; C), Melandrium album (Sm/Av; C), Sclerantus perennis (Sm/Av; C), Silene vulgaris var. humillis (Vc; C), Viscaria vulgaris (Sm/Av; C); Chenopodiaceae: Chenopodium album (Sm/Av; C), C. polyspermum (Sm/Av; C); Cistaceae: Helianthemum nummularium (FB; C); Convolvulaceae: Convolvulus arvensis (Sm/Av; C), Calystegia sepium (QF; C); Crassulaceae: Sedum acre (KgCc; C), S. maximum (FB; C); Cyperaceae: Carex caryophyllea (KgCc; C), C. echinata (FB; C), C. flacca (MA; C), C. hirta (MA; C); Dipsacaceae: Dipsacus sylvestris (Sm/Av; C), Knaucia arvensis (MA; C), Scabiosa ochroleuca (FB; C); Equiseataceae: Equisetum variegatum (MA; C), E. arvense (Sm/Av; C), E. pratense (Sm/Av; C); Euphorbiaceae: Euphorbia cyparyssias (FB; C), E. esula (Sm/Av; C); Fabaceae: Anthyllis vulneraria (FB; C), Coronilla varia (FB; C), Lathyrus pratensis (MA; C), Lotus corniculatus (MA; C), Medicago falcata (FB; C), M. lupulina (MA; C), M. sativa (Sm/Av; S), Melilotus alba (Sm/Av; S), M. officinalis (Sm/Av; C), Ononis spinosa (FB; C), Trifolium arvense (FB; C), T. pratense (MA; S), T. repens (MA; S), Vicia cracca (MA; C), V. grandiflora (Sm/Av; C), V. hirsuta (FB; C), V. sativa (Sm/Av; S), V. tetrasperma (FB; C); Geraniaceae: Geranium pratense (MA; C); Hypericaceae: Hypericum perforatum (FB; C); Lamiaceae: Ajuga reptans (QF; C), Galeopsis speciosa (Sm/Av; C), Glechoma hederacea (Sm/Av; C), Mentha arvensis (Sm/Av; C), Origanum vulgare (FB; C), Stachys palustris (Sm/Av; C), Thymus pulegioides (FB; C), T. serpyllum (KgCc; C); Linaceae: Linum catharticum (FB; C); Lythraceae: Lythrum salicaria (MA; C); Onagraceae: Chamaenerion angustifolium (Sm/Av; C), Oenothera biennis (Sm/Av; C); Orchidaceae: Epipactis atrorubens (FB; C), E. helleborine (QF; C); Oxalidaceae: Oxalis dillenii (Sm/Av; C); Papaveraceae: Papaver argemone (Sm/Av; C), Papaver rhoeas (Sm/Av; C); Plantaginaceae: Plantago lanceolata (MA; C), P. major (Sm/Av; C); Plumbaginaceae: Armeria maritima subsp. elongata (KgCc; C); Poaceae: Agrostis capillaris (FB; C), A. gigantea (MA; S), Apera spica-venti (Sm/Av; C), Arrhenatherum elatius (MA; C), Avena sativa (Sm/Av; C), Avenula pubescens (FB; C), Bromus hordeaceus (Sm/Av; C), B. inermis (FB; C), Calamagrostis epigejos (FB; C), Corynephorus canescens (KgCc; C), Dactylis glomerata (MA; S), Deschampsia caespitosa (MA; C), Echinochloa crus-galli (Sm/Av; C), Elymus caninus (Sm/Av; C), E. repens (Sm/Av; C), Festuca arundinacea (MA; S), F. pratensis (MA; S), F. rubra (MA; S), F. tenuifolia (KgCc; C), F. trachyphylla (FB; C), Holcus lanatus (MA; C), Koeleria glauca (KgCc; C), Lolium multiflorum (MA; S), L. perenne (MA; S), Molinia caerulea (MA; C), Phalaris arundinacea (MA; C), Phleum pratense (MA; S), Phragmites australis (MA; C), Poa angustifolia (FB; C), P. compressa (FB; C), P. pratensis (MA; S), Setaria viridis (Sm/Av; C); Polygonaceae: Fallopia convolvulus (Sm/Av; C), Polygonum aviculare (Sm/Av; C), P. lapathifolium subsp. lapathifolium (Sm/Av; C), P. persicaria (Sm/Av; C), Rumex acetosa (MA; C), R. acetosella (KgCc; C), R. crispus (Sm/Av; C); Primulaceae: Lysimachia nummularia (QF; C), L. vulgaris (MA; C); Ranunculaceae: Consolida regalis (Sm/Av; C), Ranunculus acris (MA; C), R. repens (MA; C); Rosaceae: Achillea millefolium (MA; C), Agrimonia eupatoria (FB; C), Fragaria vesca (FB; C), Potentilla anserina (Sm/Av; C), P. argentea (FB; C), P. reptans (MA; C), Sanguisorba minor (FB; C), S. officinalis (MA; C); Rubiaceae: Galium molugo (MA; C), G. verum (MA; C); Scrophulariaceae: Chaenorhinum minus (Sm/Av; C), Linaria vulgaris (FB; C), Rhinanthus serotinus (Sm/Av; C), Scrophularia nodosa (QF; C), Verbascum lychnitis (FB; C), V. nigrum (FB; C), V. thapsus (FB; C), Euphrasia rostkoviana (FB; C); Urticaceae: Urtica dioica (QF; C); Valerianaceae: Valeriana officinalis (MA; C); Violaceae: Viola arvensis (Sm/Av; C), V. collina (FB; C), V. tricolor (Sm/Av; C).